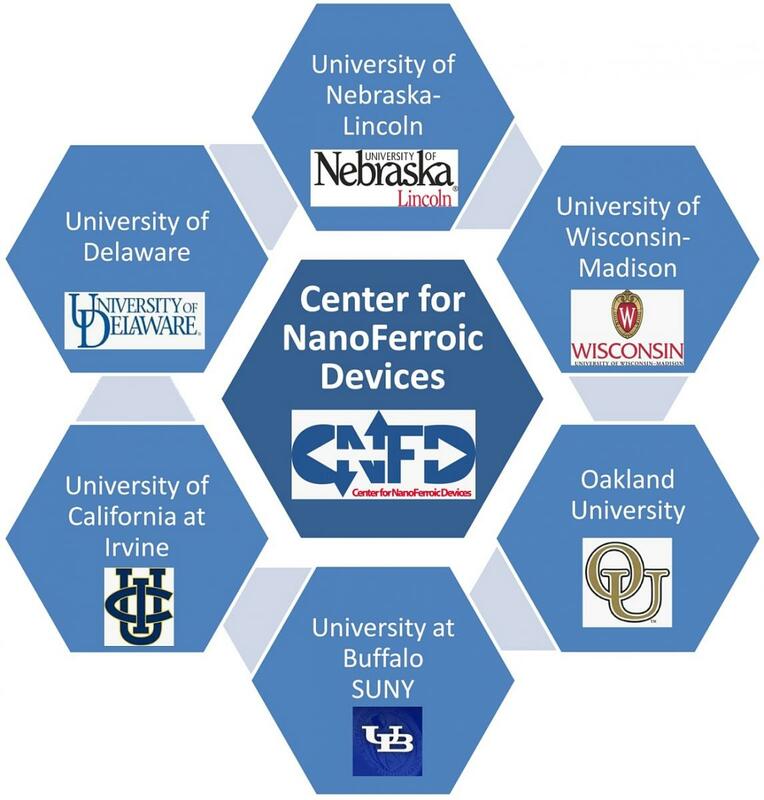 The Center for NanoFerroic Devices (CNFD) is one of the three centers sponsored by the Nano-electronics Research Initiative (NRI) and the National Institute of Standards and Technology (NIST) The Nanoelectronics Research Initiative is a consortium of companies in the Semiconductor Research Corporation (SRC) seeking to develop a device that can scale computer technology beyond CMOS (Complementary Metal Oxide Semiconductor). CNFD targets non-conventional, low-energy technologies based on innovative functional materials systems and conceptually novel approaches for device operation. Research involves exploration of properties, materials, structures, and phenomena non-traditional for existing technologies, such as magnetoelectricity, ferroelectricity, and spin dynamics. CNFD is exploiting these concepts in novel devices utilizing state variables different from charge and exhibiting significant switching effects that are robust enough to be harnessed as manufacturable technologies. These devices involve new energy-efficient technologies combining memory and logic functions with potential to outperform CMOS approaches on critical applications. CNFD is a partnership of investigators from six academic institutions: University of Nebraska-Lincoln (UNL), University of California at Irvine (UCI), University of Wisconsin-Madison (UWM), University at Buffalo, SUNY (UB), University of Delaware (UD), and Oakland University (OU). UNL serves as lead institution. » The NRI Annual Review will take place on Oct. 17, 2017, in Gaithersburg, MD. » The CNFD Annual Review was held on Aug. 29-30, 2017, at the University of Nebraska-Lincoln. » NRI Annual Review Oct. 17, 2017, in Gaithersburg, MD.